In recent years, visuals and infographics have grown in popularity as vehicles to explain complex concepts, move people to grassroots action, and elevate key messages. With many states actively considering coverage gap proposals and legislative sessions in full swing, we wanted to share a collection of coverage gap visuals being used in states and also point out some free and low-cost tools advocates can use to create them. Before we get to the examples from states, check out our new map that makes the case that coverage gap campaigns are active and moving forward in conservative states. Explaining the coverage gap can be complicated. Many states use visuals instead of words to get across the concept of what it means to have a coverage gap in their state. Originally from Nebraska Appleseed, this graphic was adapted by Virginia Consumer Voices for Healthcare and many other states. Tennessee Justice Center added key messages about working people in the gap to their graphic. This graphic from North Carolina Justice Center talks about how closing the gap “completes the picture” of health insurance for all North Carolinians. The Commonwealth Institute of Fiscal Analysis in Virginia put together this comprehensive chartbook with many excellent graphics about Medicaid and the coverage gap. Who Falls Into the Gap? We know that adding certain information about who falls into the gap helps build support from conservative audiences. These graphics talk about how people in the gap are working, specific industries they work in, or other demographic information. 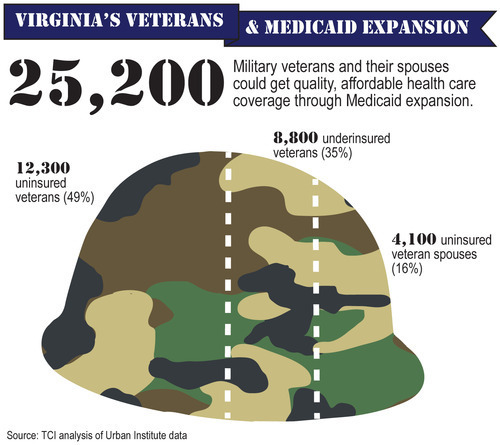 The Commonwealth Institute for Fiscal Analysis in Virginia used a graphic to highlight data about veterans who fall into the gap. Voices for Utah Children also used this graphic to push back against common assumptions about who falls into the gap. Idaho Kids Count’s graphic contrasts two Idaho families, one in the gap and one eligible for a Marketplace tax credit. One of the most common themes in coverage gap graphics is the economic and fiscal benefits to states. Graphics are a great way to take wonky economic data and make the point that closing the gap is the right thing for a state’s economy and its budget. Voices for Utah Children uses this graphic to make the point that this is a “boring” policy analysis problem because the fiscal benefits are a slam dunk for the state. The Texas coalition created this graphic to show how many jobs would be created and how much federal money will flow to the state when they close the gap. Georgia Budget and Policy Center shows how closing the coverage gap has real “bang for the buck” for Georgia. Kaiser Family Foundation created this graphic to show a range of economic benefits to states who close the gap. Canva. Free to sign up and use. Some images and graphics come at a nominal additional cost, think in the range of 1-2 dollars. Info.gram. Free to sign up and use basic templates. Easel.ly. Free to sign up and use templates. HubSpot Templates. Free templates to download and easily manipulate in PowerPoint. We hope these will be helpful as your campaigns continue. If you have any questions, please contact Lucy Dagneau at ldagneau@communitycatalyst.org.